I just downed all five parts of this in less than a week. I don't think I recommend doing that unless you have a stronger stomach than me. Anyway, this episode was really interesting for all the parts about Rasputin and his indirect impact on the war. It's insane to me that someone so enigmatic and larger than life was alive and kicking as late as the early 1900s. Feels like something about of a Greek myth. I enjoyed the show, and appreciate all the hard work that went into it. . . but, in this case I found the host's political slant impossible to ignore and far enough misaligned with my own biases that it's hard to fully embrace the rest of the program. First of all, he gives both too little and too much credit to the revolutionary movements in Russia. In the first case, there's no doubt Lenin was an important guy, and getting secret passage on a German train influenced the events that immediately following his return. But, to cast that minor bit of assistance to a revolution that was already steaming along as the seed of a "virus" that would undermine the German empire is giving a lot of credit to the minor acts of German nobles and far too little credit to thousands of Russian revolutionaries. (The use of the word "virus" isn't exactly a neutral choice, either.) There's real and interesting irony in pointing out that the German state did briefly materially support the Bolsheviks, but it's worth a momentary laugh, not endless repetition as one of the big lessons of history. In the second case, attributing the defection of German soldiers to Bolshevik influence, rather than their being conscripts who witnessed years of brutal and hopeless war only to see guaranteed defeat and suicidal leadership strains credibility. I'm sure German officers blamed the Bolsheviks for defection in their ranks, but we should think carefully before we accept the idea. You don't have to look too far to find prominent anti-monarchists, democrats, and socialists in Germany long before the war. And, "foreign agitators" is such a common, and commonly debunked, cry by panicked tyrants that we should treat anyone who uses it with extreme skepticism. Such a claim demands proof, and none is given. 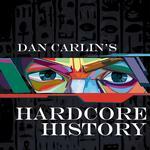 The events Carlin presents could be woven into a number of very different narratives. For example, "Germany made the mistake of giving critical assistance to the Bolsheviks during the revolution, and communism spread to infect the loyal German troops." Or, alternatively, "the war was a doomed, last ditch effort by failing empires to maintain themselves amid global unrest, which precipitated both the Russian revolution and the collapse of German moral." Choosing the former is an active decision to side with the spokesmen for empire. Coming on the heels of ten hours of testimony that the war was horrifying, pointless, and lead by idiots. . . it's an odd choice. What's more, the endless celebration of the heroes of battle, and lack of celebration of those who opposed the war is conspicuous. Repeatedly we're told the socialists said perfectly reasonable and ethical things that anyone in the audience would agree with, and then cautioned that we shouldn't forget the "evil" of communism. Finally, throughout the episode, we're urged to celebrate the bravery of the soldiers who dutifully marched to their deaths on a suicide mission to save a doomed empire. What about the brave soldiers and sailors who faced execution for mutiny rather than engage in pointless bloodshed? If you ask me, the sailors who refused a glorious suicide mission at the end of the war deserve more praise than anyone who leapt out of a trench and ran to certain death on behalf of their kaiser. Facing death in order to end a war is no small feat, and writing it off to Bolshevik influence robs those brave people of their dignity. Which is to say, I enjoyed the show, but I wish Carlin would go back to talking about pre-Renaissance history, about which I know so little that I don't notice his biases. Looks like my previous comment was actually intended for the next episode, "Blueprint for Armageddon VI." Shows what a stickler for detail I am.